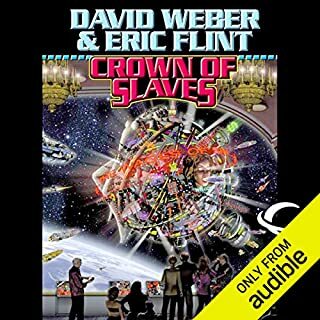 ©1997 Baen (P)2009 Audible, Inc. This series has been very enjoyable to listen too. 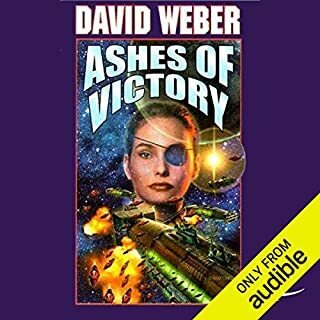 These books are somewhat uplifting - I guess that's the fantasy part of a galactic war - but - The good guys are good and the bad guys are bad, however, they may or may not be enemies. 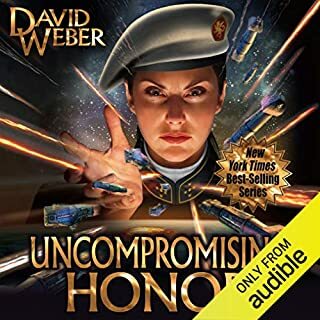 There is a couple improvements that Audible could make on most of these series of books - like the honor harrington series. First, I'd like to know what book in a series I'm buying without having to research the series, book 1,2,3, etc. 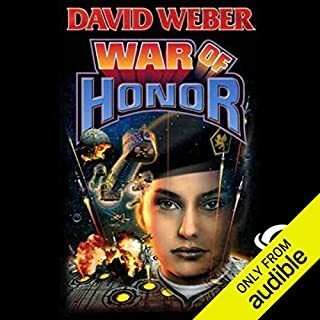 You can't go by audible's release date, they tend to release some of the latest books first, look at "War of Honor" in this series. The easiest way I have found to identify the series order is to Google them. Googling the series brings up the author's comments in Amazon which usually will tell you the series order. 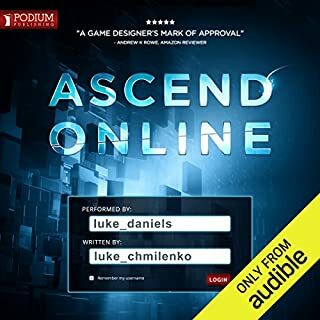 My second recommendation for improvements was to do with getting comments/reviews on the books in Audible. I believe that Amazon is the parent company to Audible, so why not have Audible reviews "hot link" to the Amazon reviews of the same book, especially where there are no reviews in Audible. This would eliminate someone from having to copy the title, going to Amazon and searching their books for reviews and comments. Sorry, for straying a little, but I hope it helps. I have enjoyed this series about Honor Harrington and have read them in order for far. 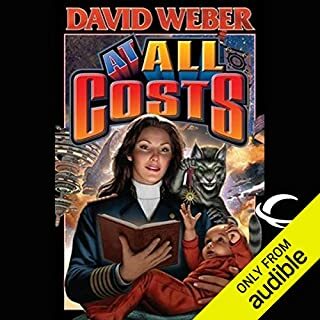 Unlike the other reviewers I actually like Allyson Johnson's narration of the series. I like the fact that enemies can act honorably in spite of a war. It was nice that a villain from the first book in the series became man enough to admit he was wrong and apologize to Honor. Can not wait to read the next story in the series. 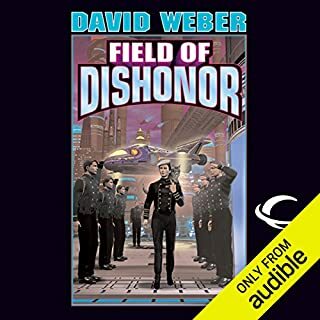 I didn't read the Honor Harrington series before listening to them. Perhaps because I had no preconceptions I'm not bothered by the narrator's reading. I think she does fine. 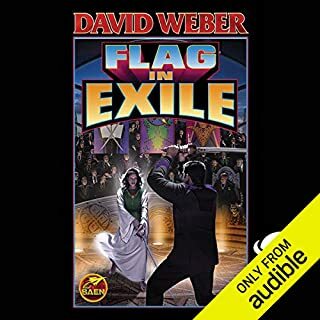 I'm not sure why people need a list of the order of the books when Audible tells you which book number it is in the title. That being said this series has great characters, well explained technology and interesting story lines. 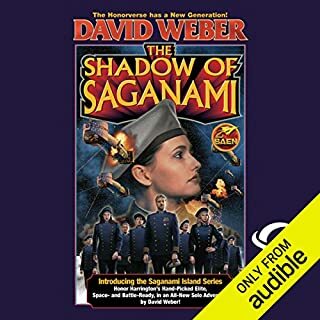 I'm looking forward to listening to the rest of the books. It's been three years since Honor was put on half pay, but now she is offered a new command. Instead of feeling grateful, this new assignment can be considered a slap in a face. But.... it can be good opportunity for pirate hunting , but you never know what you fish out. 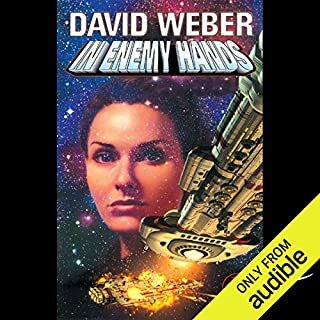 Next book is "In Enemy Hands"
The series is certainly picking up the paces and becoming a far more interesting. Particularly after book five. Now that the world is laid out in more detail I think I'm going to be pretty happy following the series through. 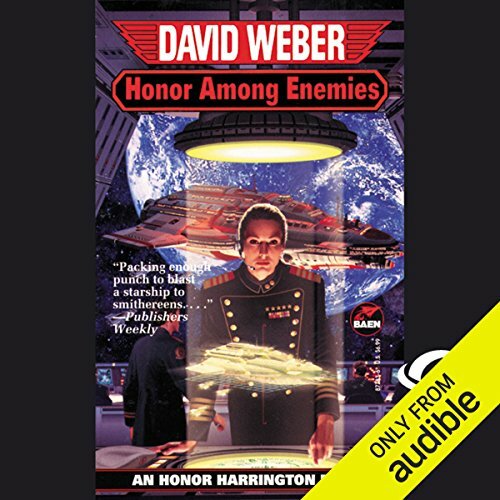 What made the experience of listening to Honor Among Enemies the most enjoyable? The story was great. Sound and performance carried it well. Honor, because she works though her problems. And the enlisted petty officers carrying the load. I like her performance. Pace and inflection draws you into story time. Sad about losing some favorite crew. I like this series enough to keep reading it, but it's not the best thing I've ever read. It's strongest when it focuses on naval operations and the particularities of the far future setting. I enjoy the "Napoleonic Wars In Space," schtick. The political infighting within all the big nations is completely believable. 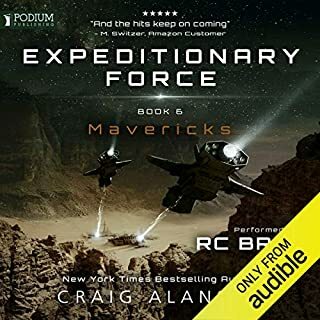 The way the space technology works is extremely detailed, which is fine, and the way the setting re-creates an interesting historical period in the far future is a treat. This book was a partial return to what made the first book successful. 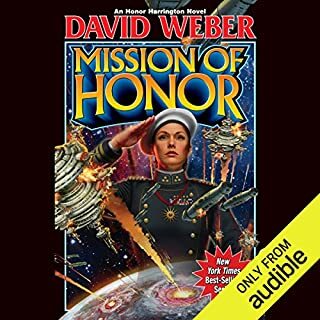 Honor Harrington does "Navy Stuff,"- she commands a starship, fights space pirates, makes life or death decisions, and suffers the consequences. The subplots are all set up well and all pay off. I particularly enjoyed the plight of the People's Navy officers who were too decent for their own good. The theme that civilized states, even when they fight one another, are all superior to barbarians resonates with me. The series is weakest when it wallows in the protagonist's emotional life (for someone who has killed thousands of people in space battles she sure has a lot of angst about relatively minor problems), with the absolute low point in every book being when the space cats appear. Cats don't belong on naval vessels, ever, and should be thrown over the side, or out the airlock, whenever an infestation appears. These animals gain more intelligence, telepathic powers, and page space in each successive book of the series and are obviously not ever going to be killed, by anything, ever, despite how ridiculous they are. To me, they are the Jar-Jar Binks of the whole fictional universe. Maybe David Weber likes cats? When Honor Harrington becomes an action hero, able to defeat anyone at their own game, I roll my eyes. This is the stuff of B-grade action movies. Since the tone of these books is light, perhaps I shouldn't complain about it. "Honor Among Enemies," only has one scene like this, but it's set up before hand (unfortunately that setup is a big clunker, having to do with a madman, a nuclear trigger, and an over-involved negotiation that I mostly skipped through.) The resolution was a surprise, using a "Chekov's Gun" that I'd mostly forgotten about. The "Navy Stuff," is very well done. I served four years in the the US Navy, and the books have a good grasp of what it's like to be in the service. The "lower decks" subplot with Petty Officer Wunderman is sadly a very common experience. 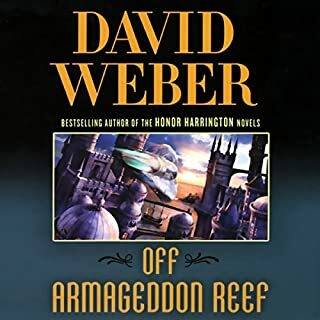 My understanding is that David Weber is a naval historian, and it shows. 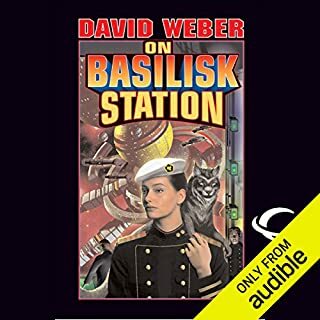 All in all, this is a much better book than the previous entry of the series, which spent far too little time in space. The narration is good. 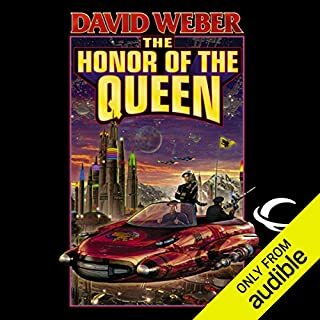 I don't know why so many people are annoyed by it, but with the main character being female dictates that a female narrator should be reading the book. 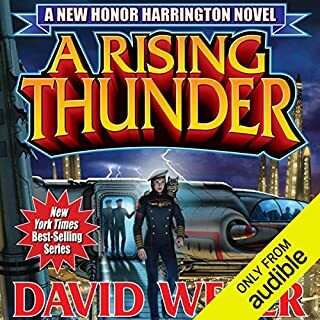 The narrator does a much better job with the male voices than almost any male reader would do with female voices, and since Honor Harrington is doing most of the talking it makes complete sense. The one character that, to me, sounded silly died in book four. 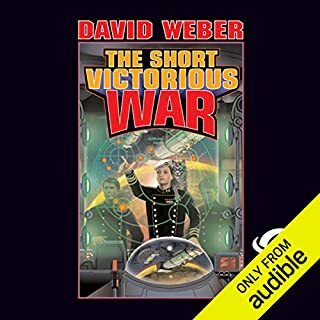 I can always tell the characters apart, and the foreign accents make sense given that this is the "Napoleonic Wars In Space." This is the 6th book in the main Honor Harrington Series, and covers her rehabilitation as an officer in the RMN. The story continues with Honor leading a squadron of Q ships. Excellent story, but the same abysmal performance from Ms. Johnson. I've learned to mostly ignore it and just enjoy Mr. Weber's book. This was one of my favorites in the series. Good pacing and kept my attention. As you can tell from the cover Honor gets called back to active duty in the RMN. It's kind of a step down for her, and partially set up by her enemies who hope this will be a suicide mission. The story starts slow, in the manner of the old sea stories by CS Forester and Patrick O'Brian. Not surprising since Honor herself reads the old novels, puzzling about the meaning of pounds, feet and miles. The story is good, with a lot of interaction with the People's Navy. It turns out that the officers of the Peep Navy are not so bad after all. The Honor story continues with this book, as good as the preceding volumes. The multiple subplots keeps the reader in suspense. I find the narration to be just fine, no complaints there. The end of the story is satisfying, except perhaps for the tens of thousands of dead 'red shirts' left behind. I took off one story star only because I found the huge size of the Starship crews seemed to me to be almost ridiculous. Several thousand on a medium sized warship. Several hundred thousand on a military space station? One of the subplots would have been ruined if the Star Kingdom has the Disney Magic Band (tm) technology to keep track of where the crew members are located on the ship. The ships internal communications seemed to be about that of a WWI battleship much of the time. One other observation, not a fault, but something occurred to me. 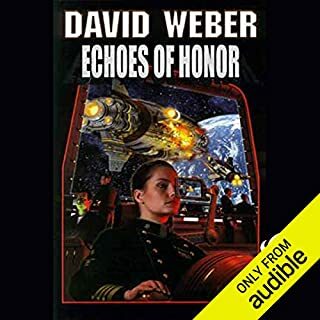 The Honorverse has no robots!!!!! Hyperspeed travel yes? No robots though. Who'd have thunk it? !